What Kind of Damage Can We Repair? If your brick wall doesn’t behave as it is supposed to, and has developed problems, you can explain the situation to our experts. They will visit your property to assess the damage and recommend solutions for repointing and repairing brickwork accordingly. Cover the area near the wall with plastic sheets to ensure the clean-up process is easy. Remove the old pointing with hammer and chisel carefully. Our skilled repairmen will ensure the surrounding brick isn’t damaged during the process. Once all the mortar is removed and the edges are preserved, we will start filling the gaps with fresh mortar. Make sure all dust is removed from the gaps to ensure the new mortar adheres well to the bricks. After all the gaps are filled, we’ll remove the excess mortar with the wire brush and ensure the wall is perfectly even for finishing. Our technicians will then move on to finish the wall and make it presentable. Once the wall is painted and finished, we will remove the plastic sheets and do the final clean-up before we leave your property. 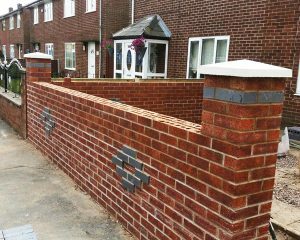 If you want to know more about our services of repointing and repairing brickwork here at AC Joinery, don’t hesitate to get in touch with us. You can call us at 0161 980 7992 or contact us through our web form today.